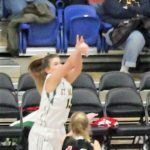 WILMINGTON – Ursuline’s Kay Wulah scored 19 points and played outstanding defense all night to lead the Raiders to a 48-34 win over St. Mark’s in Catholic Conference girls basketball on Feb. 8 at the 76ers Fieldhouse in Wilmington. 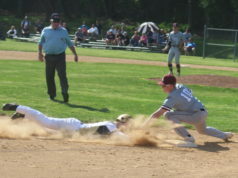 The game was part of the SL24 Memorial Classic, which raised more than $208,000 for mental health awareness. 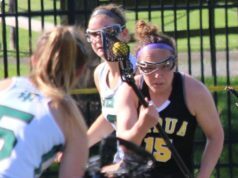 The teams came out running in the first quarter, with Ursuline pounding the inside, particularly Wulah, who scored six in the first. 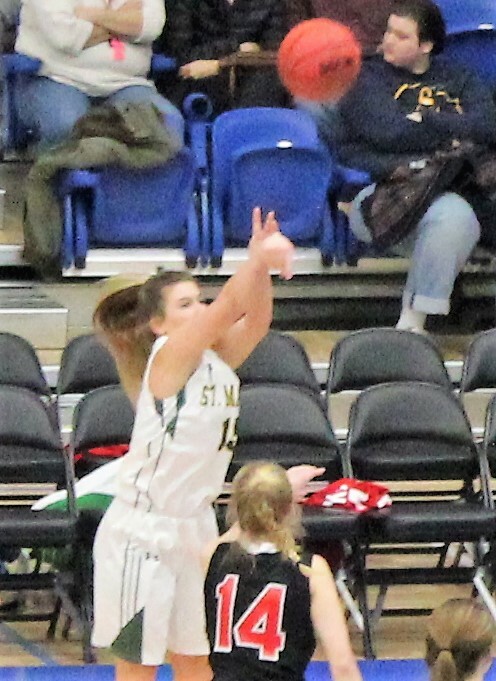 St. Mark’s, meanwhile, stayed close thanks to Kayla Wolff, who scored all eight of the Spartans’ points in the first, six of those on three-point shots. Wulah kept her scoring going early in the second. She hit a layup to open the quarter, then teamed with Lauren Dorsey on a slick give-and-go to extend the Raiders’ lead to 17-8. 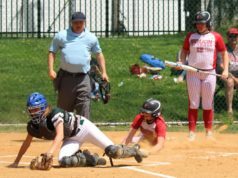 DD Shepherd got two of those back for the Spartans, but Emily Rzucidlo connected from deep to make the score 20-10. St. Mark’s still trailed by 10 with 4:30 to go in the half, but they were just warming up. Shepherd made a free throw, and after a Raiders turnover, Shepherd made Ursuline pay with a deep triple. Wolff hit a scoop shot before Wulah ended the six-point run with yet another layup. 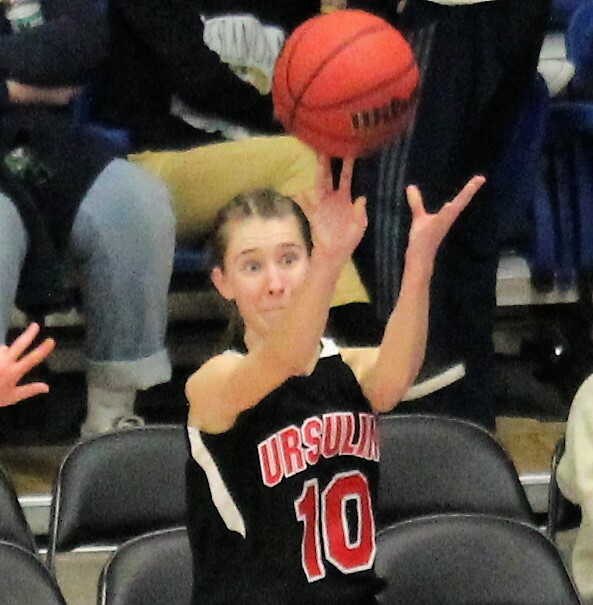 At the half, Ursuline’s lead was 24-20. 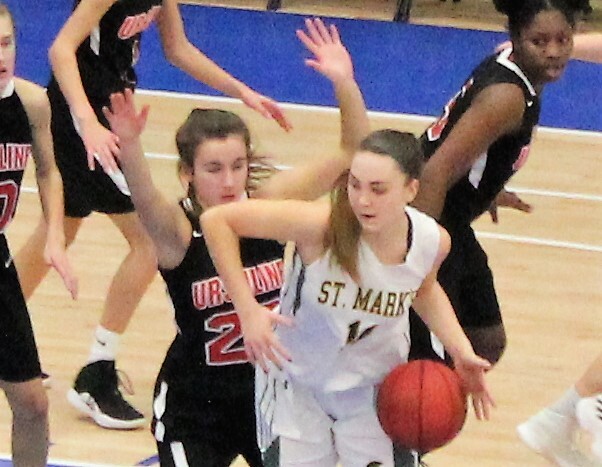 St. Mark’s scored just 18 points in a loss to Ursuline on Jan. 24. 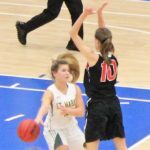 The Spartans cut the deficit to two points on a mid-range Wolff jumper two minutes into the third, but that was the only field goal they would get in the quarter, as the Raiders cranked up the defensive pressure. 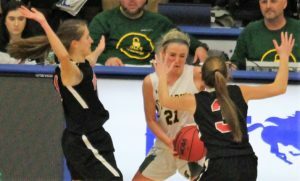 The Raiders started slow offensively in the second half but found some range. Wulah made two more field goals in the third, and Abby Rzucidlo went three of four from the free throw line as the Raiders outscored the Spartans, 11-1, over the remainder of the third. Abby Rzucidlo puts up a shot for the Raiders. 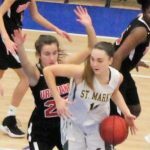 Wolff continued her scoring in the fourth, and Shepherd his another three-pointer, but St. Mark’s could not close the gap significantly. 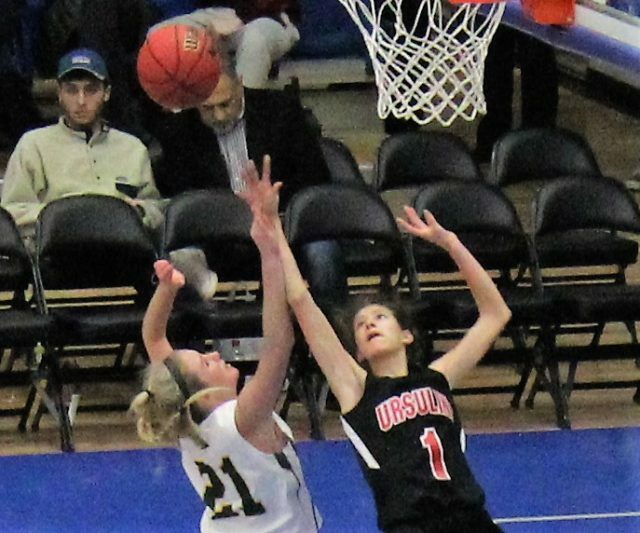 Wulah punctuated her evening with a three-point shot from the top of the key late in the game. Emily Rzucidlo had 11 to join Wulah in double figures for Ursuline. The Raiders are now 6-9 and host the state’s top-ranked team, Conrad, on Sunday at 12:15 p.m.
Wolff had 16 to lead the Spartans, and Shepherd added 10. The Spartans (6-10) play their home finale on Tuesday at 7:30 p.m. against Delcastle.